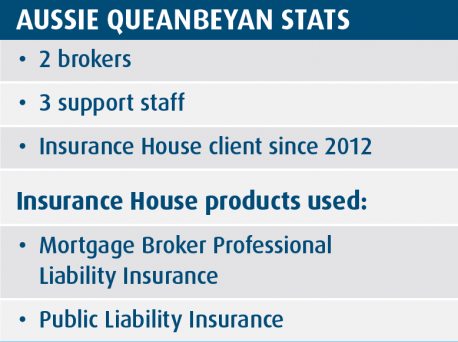 After a career in the banking industry, Ben Hennessey formed Aussie Queanbeyan with another mortgage broker in 2017. With five support staff, they have already gained a trusted reputation with their clients – witnessed by numerous messages of support they’ve received since publication of the recommendations of the Royal Commission into Banking. Unfortunately, one of Ben’s customers was not happy with the outcome of his settlement process. Despite Ben advising the couple to engage a solicitor or conveyancing service early on – even offering local contacts – they wanted to manage the process themselves. As a result, necessary paperwork was not supplied in time, delaying the approval of finance and therefore delaying the settlement date. The customers then wanted Aussie Queanbeyan to pay compensation for the delay. After a failed internal dispute process, they lodged a complaint with the ACT Civil and Administrative Tribunal. "Insurance House has made the process so easy for us. It was literally set and forget". The firm advised its professional indemnity insurance providers, Insurance House, of the complaint against it. They just do everything for you,” Ben says. One strategy of the Insurance House solicitor has been to insist the complainants provide evidence of their claims. “We had already provided lots of evidence. For example, the customers claimed we didn’t call them over a period, but we have records of all the calls we made to them,” Ben says. Six months later, the complaint is still before the ACT Tribunal, but Ben and his team have nothing to worry about. “We’d rather pay professional indemnity insurance and be protected,” Ben reckons.